An impressive 40 Park City Ski Team athletes recently qualified for the Intermountain Division Championship in Grand Targhee, Wyo. At these championships, local kids ages 9 to 12 compete against the best skiers from Utah, Idaho and Wyoming. 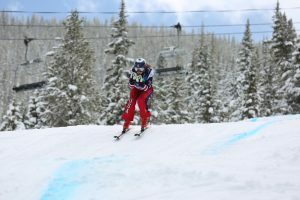 The races took place over three days and included dual slalom, giant slalom and slalom. According to Jason Lance, Park City Ski Team U12 head coach, the race hill was very steep and difficult, but he was impressed with how well these young athletes handled the challenging terrain and courses set. Friday’s dual slalom was modeled after the pro format, including a skill-testing jump mid-course. Harry Hoffman raced to second place and Stephan Brennwald toook a third-place finish in the U10 boys, and a few minutes later Ani Jensen secured another bronze medal finish in the U12 girls. In Saturday’s giant slalom, the best results from the Park City Ski Team came in the U12 class where Lauren Macuga had a strong third-place finish, followed by Mia Hunt in fifth. The boys showed depth with Thomas Hoffman in fourth, Andrew Hoggan in fifth and Jack Schaede in sixth. Espen Hunt and Stephen Brennwald took fifth and sixth place in the U10 boys. Sunday’s slalom proved to be difficult for the youngsters as 15 out of 63 competitors in the U12 boys failed to finish the race. Many other racers fell but got up and continued to the finish. In the U10 class Cameron Iacobelli and Caeli Sherman were the highest local finishers in sixth and eighth respectively. In the U12 girls Grace Sherman came in seventh, and Park City Ski Team had four other girls in the top 14. In the U12 boys Justin Bigatel finished eightth and Leyton Sheppard 10th. Although occasionally nicknamed "Grand Foghee" by locals, the mountain showed itself at its best over the weekend with mostly sunny skies, great snow conditions and inspirational scenery of the Grand Tetons. The race organizers did a very good job and the Park City Ski Team athletes had fun competing and socializing with athletes from the northern part of the division.